Timeless fairy tale classic about a lonely king and a cat who changes the king’s life. Far away from here, on the shore of a distant sea, there was a wonderful house. And in the house lived a little white-bearded king. So begins the story of Mister King, a king with one big problem – he has no subjects. His beautiful castle and many fine possessions fail to delight him, for he feels lonely and useless. When one day an unusual cat comes to the castle for shelter, Mister King suddenly finds his life taking a new direction. The renowned author Raija Siekkinen’s (1954-2004) gentle and humoristic tale was a winner of Otava’s picture book competition. 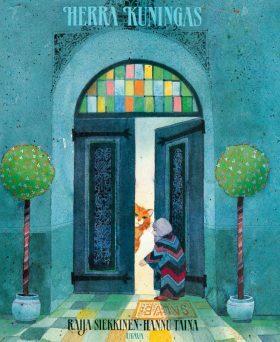 The Biennale of Illustrations Bratislava (BIB), which is considered the largest and most prestigious international competition and exhibition of children’s book illustrations in the world, awarded Hannu Taina with BIB Grand Prix award for his illustrations in Mister King.